Sarah Johnson, MSc, Diplôme Pilates Master, Diplômée (BEES 1er degré des métiers de la forme) I moved to France with my family in October 2005 and set up Revive in November 2006. I aim to provide the highest level of exercise, motivation and fun for those wanting to achieve their goals in health and fitness, whether this be in a class or on a one-to-one basis in my home Pilates Studio. I have always enjoyed sport and exercise. As a former athlete and keen squash player I now prefer cycling, Nordic walking and Pilates. I have taken part in several sporting charity challenges including half-marathons, a 4-day bike ride from London to Paris and I cycled up Mont Ventoux in aid of the charity Overcoming MS.
Pilates is an ongoing journey for me and it’s my joy and my privilege to teach it. I hope to be able to inspire you to achieve a better understanding of your body, a better health, and a fitter functional body. My qualifications have also been recognised by the Ministère de la Jeunesse et des Sports in France as equivalent to the brevet d'etat d'educateur sportif 1er degré, option métiers de la forme, which is compulsory for all exercise professionals in France. *The Diplôme Pilates Master, is a qualification that can only be achieved as a result of more than 500 hours of training. It is awarded by “Le Loft Pilates”, based at Fit Studio, Ramatuelle, St Tropez by Eva Winskill. 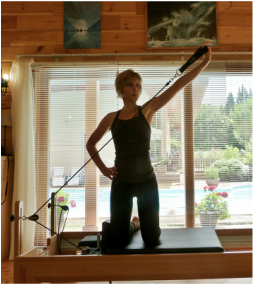 She has more than 25 years of experience, teaching Pilates and working in the world of fitness. The training at Le Loft Pilates is based on the method of Michael King (one of the founders of the Pilates Institute). Michael King has a worldwide reputation as presenter of Pilates. His training programs are taught in over 30 countries worldwide. 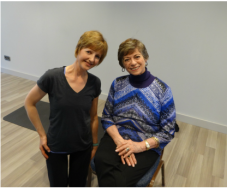 I am currently studying with New York-based Shari Berkowitz of The Vertical Workshop on an 18 month Intensive Program for Pilates Teachers, which applies modern biomechanics and functional anatomy to the Classical Pilates Method. Convention Zest 'Pilates, 2 days of workshops (Michael King Pilates, London), September 2012.